DET CRC’s RoXplorer® coiled tubing (CT) drill rig has completed very successful field trials in the consolidated cover rocks of the Gawler Craton (near Port Augusta, South Australia, February –March 2017) and the unconsolidated cover rocks of the Murray Basin (near Horsham, Victoria, May – June 2017). We have also received the results of assays of samples of the coiled tubing drilling cuttings from the Port Augusta trial. Their match to assays of diamond drill core from an adjacent hole are remarkable. Highlights include the following. The RoXplorer® CT rig drills to 500 m depth using a continuous, malleable steel coil and drills ahead with no-one near the drill string and no rod handling, thereby removing the major cause of injury in mineral exploration. The downhole motors, hammers and bits of the RoXplorer® CT rig are driven by fluids fully recycled using a solids removal unit (shakers, filters and centrifuges): no fluids on ground surface, no sump is dug. The RoXplorer® CT rig weighs only 15 tonnes (including coiled tubing drill string) and can be easily road transported without the need for special permits. The Port Augusta trial demonstrates that hard rocks can be drilled at rates approaching 100 m per 12 hour shift across multiple shifts with excellent sample return. The Horsham trial demonstrates that unconsolidated cover overlying prospective basement, and underlying basement, can also be drilled at similar rates with excellent sample return. Assays of the cuttings from the Port Augusta trial show a remarkable match to assays of diamond drill core from an adjacent hole, including across a narrow zone (~1 m) of low grade copper mineralisation at ~400 m depth. We do not believe that the hole at Horsham could have been drilled by reverse circulation (RC) methods, thus the CT method provides the only cost-effective alternative to expensive sonic or mud rotary surface and diamond tailed holes in the highly prospective basement sequences covered by the Murray Basin. The RoXplorer® coiled tubing-drilled holes were straight and vertical as intended in both trials. We believe this new technology has opened the Gawler Craton, Murray Basin and similar areas of extensive cover to ‘prospecting drilling’ which will enable progressive vectoring towards concealed mineral deposits using multiple, cheap holes in a single drilling campaign, thereby opening the covered mineral exploration search space. The Port Augusta trial site provided an example of typical, consolidated and lithified Adelaidean cover of the Gawler Craton, including sandstones trending to quartzites and underlying volcanics. The RoXplorer® rig is a hybrid rig, designed for coiled tubing drilling but also capable of drilling with a top drive and conventional drill rods. In the Port Augusta trial we first drilled in conventional top-drive mode to ~30 m, cased with steel pipe and cemented in the casing. The main hole was then drilled into open formation with a downhole hammer and percussion bit powered by a downhole motor in CT drilling mode. The rig drilled 367 metres in four successive 12 hour shifts, for an average of ~92 metres per shift and at an average penetration rate when drilling of ~15 metres per hour. This compares with around 25 metres per shift at an average penetration rate when drilling of ~3 metres per hour diamond drilling in the adjacent hole. The hole was terminated at just over 400 metres depth having intersected the target basalt. We are delighted to advise that the results of assays of samples of cuttings from the RoXplorer® Port Augusta trial compare favourably with assays of half-core samples taken at 50 cm intervals from the adjacent diamond hole. Concentrations of major and trace elements closely match those obtained from the half-core sampling, giving no indication of sample bias or contamination as per the Figure below. Samples from over 400 m depth can be assigned to a depth interval with decimetre accuracy. It is particularly pleasing that a narrow (~1 m) interval of low grade copper enrichment at the top of the Beda Basalt with visible chalcopyrite in coiled tubing cuttings samples and diamond core is faithfully represented in the assay data from the coiled tubing cuttings. An immediately overlying ~1 m bleached zone of iron depletion at the base of the Tapley Hill Formation is also faithfully represented in the assay data from the cuttings. The Horsham trial site provided an example of the even greater challenge presented by unconsolidated Cenozoic cover overlying prospective basement. The cover sequence included a lateral equivalent of the Loxton-Parilla sands (~25-40 m) and a basal cover unit of unconsolidated river pebbles (~120-135 m) overlying basement Cambrian volcanics of the Stavely province. A first trial hole by the RoXplorer® rig at the site that successfully drilled and cased to top basement was lost in association with damage to the PVC casing. The second trial hole at the Horsham site was rotary mud drilled to 42 m and cased with steel PQ casing. The hole was then drilled with the coiled tubing, a downhole motor and a blade bit and cased to 140 m (into basement volcanics) with steel HQ casing. This second hole was drilled from surface to 140 m and cased in three 12 hours shifts. The basement section of the hole was then drilled from 140 m to 407 m in another three 12 hour shifts with minimal deviation and excellent sample return throughout. The hole was terminated at 425 m. A previous sonic/diamond hole at the Horsham site was drilled to ~180m at an average of 12 m/shift. RoXplorer®’s second hole averaged 42.5 m/shift including mobilisation and demobilisation. We do not believe the cover and basement sequence at Horsham could have been successfully drilled to over 400 m by RC methods due to the combination of unconsolidated lithology, depth of cover, together with high air volume required to drill through multiple aquifers and the requirement for surface casing. 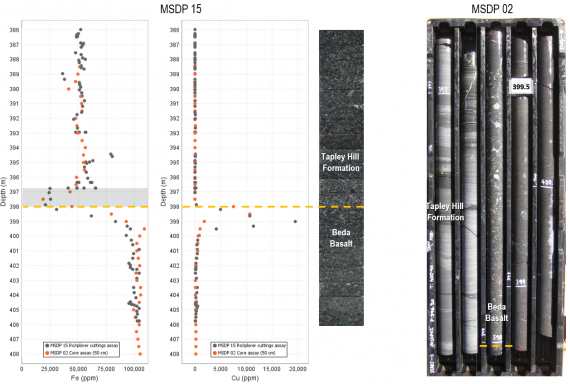 Thus the coiled tubing method provides the only viable cost-effective alternative to expensive sonic/mud rotary surface and deeper diamond-drilled ‘tails’ in the highly prospective basement sequences covered by the Murray Basin. We believe that this new technology has opened the Murray Basin (and in our previous trial the Gawler Craton), and similar areas of extensive cover, to ‘prospecting drilling’ which will enable progressive vectoring towards concealed mineral deposits using multiple, cheap holes in a single drilling campaign, thereby opening the covered mineral exploration search space. DET CRC acknowledges the outstanding team of drillers, assistants, technicians, scientists and engineers from Boart Longyear, CSIRO, Curtin University, DET CRC, Imdex, Omnilogix and the University of South Australia that undertook the trials and also acknowledges the significant permitting, logistical, safety and geological expertise provided by the Geological Surveys of South Australia and Victoria in support of the trials. The technology is expected to be offered to DET CRC partners for licencing in September. The timing of commercial release of the RoXplorer® Rig will be subject to the licencing process and its commercialisation by the licensor. These successful trials represent the culmination of an ~$20M research project by the Deep Exploration Technologies Cooperative Research Centre (DET CRC) to develop a next generation drill rig for greenfields mineral exploration that can drill at a cost of $50/metre to a depth of 500 metres.